A star that wanders too close to the supermassive black hole in the center of its galaxy will be torn apart by the black hole's gravity in a violent cataclysm called a tidal disruption event (TDE), producing a bright flare of radiation. A new study led by theoretical astrophysicists at the University of Copenhagen's Niels Bohr Institute and UC Santa Cruz provides a unified model that explains recent observations of these extreme events. The breakthrough study, published in Astrophysical Journal Letters, provides a new theoretical perspective for a fast-growing research field. “Only in the last decade or so have we been able to distinguish TDEs from other galactic phenomena, and the new model will provide us with the basic framework for understanding these rare events,” said coauthor Enrico Ramirez-Ruiz, professor and chair of astronomy and astrophysics at UC Santa Cruz and Niels Bohr Professor at the University of Copenhagen. In most galaxies, the central black hole is quiescent, not actively consuming any material and therefore not emitting any light. Tidal disruption events are rare, only happening about once every 10,000 years in a typical galaxy. When an unlucky star gets torn apart, however, the black hole is "overfed" with stellar debris for a while and emits intense radiation. While the same physics is expected to happen in all tidal disruption events, about two dozen of which have been observed so far, the observed properties of these events have shown great variation. Some emit mostly x-rays, while others emit mostly visible and ultraviolet light. Theorists have been struggling to understand this diversity and assemble different pieces of the puzzle into a coherent model. In the new model, it is the viewing angle of the observer that accounts for differences in the observations. Galaxies are oriented randomly with respect to the line of sight of observers on Earth, who see different aspects of a tidal disruption event depending on its orientation. 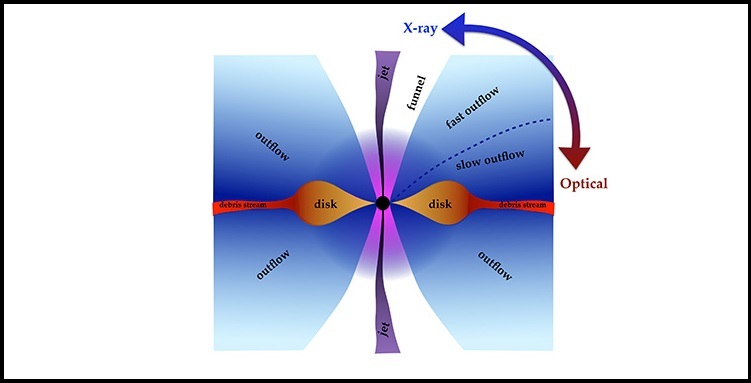 The model developed by Dai and her collaborators combines elements from general relativity, magnetic fields, radiation, and gas hydrodynamics. It shows what astronomers can expect to see when viewing tidal disruption events from different angles, allowing researchers to fit different events into a coherent framework. Survey projects planned for the next few years are expected to provide much more data on tidal disruption events and will help greatly expand this field of research, according to Dai. These include the Young Supernova Experiment (YSE) transient survey, led by the DARK Cosmology Centre at the Niels Bohr Institute and UC Santa Cruz, and the Large Synoptic Survey Telescopes being built in Chile. “We will observe hundreds to thousands of tidal disruption events in a few years. This will give us a lot of 'laboratories' to test our model and use it to understand more about black holes,” Dai said. In addition to Dai and Ramirez-Ruiz, the coauthors include Jonathan McKinney, Nathaniel Roth, and Cole Miller at the University of Maryland, College Park. State-of-the-art computational tools were employed to solve the puzzle, and the simulations were carried out by Dai and Roth on the recently acquired large computer cluster made possible by a grant from the Villum Foundation for Jens Hjorth, head of DARK Cosmology Centre, as well as clusters funded by the U.S. National Science Foundation and NASA.